This book refutes the simplistic pattern of condescending criticism versus a complaisant justification which often transpires from the debate on post-colonial Africa’s general departure from political pluralism toward autocracy under single-party regimes. Hence, it places the debate in the historical context of state craft and nation-building, whereby the line between pre-colonial heritage, colonial legacy, and post-colonial innovations, against all appearances, has chiefly been a thin one. By using the case study of Guinea, the author explores systemically (1) the nature o fthe single-party regime in first-generation post-colonial African leadership,(2) the central role of ideology in the twin-programs of statecraft and nation-building by ‘ideological one-party states’, and (3) the contribution of mass communication to the PDG (Parti Démocratique de Guinée) regime’s political survival and self-rejuvenation under the charismatic leadership of Sékou Touré from 1957 to 1984.With methodically examined inside accounts the author, himself an insider, documents the different phases and facets of the recent political history of Guinea dramatically impacted by the Cold War. From a deconstructionist perspective of the workings of the African nation-states, the author identifies the political symbiosis of ideology and mass communication as the pillar that sustained the regime, rather than state repression of political dissent or Sékou Touré’s personal charisma as widely believed. 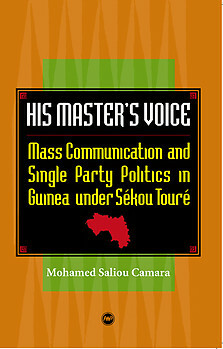 The author argues that ideology was the political blood of the party-state in Guinea and mass communication its circulatory system .He furthermore demonstrates that with Sékou Touré’s theory of information révolutionnaire serving as the official guideline for all mass communication, ideological sensitization/indoctrination and political education/regimentation of party membership led to the structural rejection of any ideas deemed incompatible with national unity. This, in turn, led to the imperceptible merger of ideology and political mythology and culminated into institutionalized self-censorship as the defining norm of revolutionary participation in statecraft and nation-building. Mohamed Saliou Camara is Assistant Professor of History and International Studies at the Embry-Riddle Aeronautical University in Daytona Beach, Florida. He holds a PhD in history from Northwestern University. He taught philosophy at the University of Conakry, broadcast for the Guinean National Radio-Television Network, and served as President of the National University Press of Guinea and as junior editor for the Presidential Press Bureau under the late President Sékou Touré.